The Cadillac SR-X is a unique car designed to create its own niche. The SRX Wagon is a cross between an SUV, an MPV, and a luxury estate. The SRX comes with a five-door body design (four-door sport utility vehicle). The Cadillac has a tall ride stance and is equipped with four-wheel drive. Inside, the steering adjusts for height but the SR-X comes optional with adjustable pedals. The SRX Wagon provides a spacious cabin with three rows of seats. The third row stores in the floor and is easily raised for use with the touch of a button. The third row of seats would not easily accommodate adults and should only be used occasionally or by small children. The Cadillac SRX’s engine is responsive even if the engine sound could be more appealing. The SR-X is equipped with computer controlled suspension and should deliver a smooth ride. Body roll is controlled for the most part but is not quite to the level of some of Cadillac’s high-end competitors. The SR-X Station Wagon provides plenty of cabin space, but it may prove difficult finding a dealer to service it. The SRX comes with high levels of equipment and lots of optional extras. The Cadillac SRX will be an expensive car to purchase and maintain. The car’s initial asking price is less than its BMW competitors but finding a location to service the car may be difficult and resale values may also be low. The SR-X provides a generous amount of cabin space and three rows of seats. The third row of seats is more difficult to access and should only be used by smaller passengers or on an occasional basis. Head and legroom is plentiful all round. The Cadillac’s controls and dials are logically placed and easy to operate. Everything is where you would expect it to be with the exception of the SRX’s foot-operated parking brake. The parking brake has a cheap feel and is difficult to use without kicking some of the plastic pieces located near the brake. The SRX Wagon provides more than adequate levels of comfort. The seats are large and comfortable and the ride is smooth. Body roll has been minimized and head and legroom are more than adequate. The SRX provides excellent access. The car’s doors open wide and provide a large aperture for easy access. The third row of seats is not as easily accessed. The boot is easily accessible as well. The Cadillac SRX is a large and oddly shaped vehicle but it provides a high drive position and good visibility making parking easier. The steering could be more responsive but is light at low speeds and does not pose an overall problem when parking. The Cadillac SR-X is easy enough to drive. The SRX Wagon comes with four-wheel drive capabilities, a 4.6-litre V8 (3.6-litre V6) engine that produces 258bhp, a five-speed automatic gearbox, and 18-inch alloy wheels. 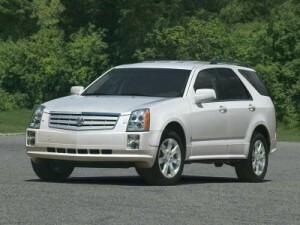 The SRX is easy enough to drive and offers a decently smooth ride. The Cadillac SRX would make a decent family car. There is ample head and legroom for the first two rows of seats and the third row could adequately accommodate smaller children. The cabin is spacious and the ride is comfortable. The SRX offers many family friendly entertainment options as well. The Cadillac SRX is not a likely first car. It is too large and too expensive. Novice drivers may have difficulty navigating and parking the SRX. Insurance, maintenance, and running costs would be on the high-end. The style of the Cadillac SRX Station Wagon will not be for everyone. The design is unique and gives the SR-X a personality that may not suit everyone. The Cadillac is quality built but may be difficult to service due to limited qualified dealers. The SR-X comes equipped with an engine immobilizer, peripheral anti-theft protection, and audio anti-theft protection. The Cadillac also comes with remote power locks, lockable glovebox, and a cargo area cover to help keep valuables out of sight. The SRX Wagon’s safety features include front side airbags, front and rear roof airbags, rear parking sensors, three-point seat belts, and driver and front passenger airbags with multi-stage deployment. The SRX also comes with electronic traction devices, ABS, and electronic brake distribution. The Cadillac SRX comes equipped with a Bose RDS audio system with satellite, CD player, and eight speakers. The audio system produces excellent sound quality steering wheel buttons are provided for the driver’s convenience. The SR-X also comes standard with metallic paint, daytime running lights, alloy rims, luxury trim wood interior, wood grain dashboard, and leather seats. The Cadillac also comes standard with a leather covered multi-functional steering wheel. The SRX Wagon comes fully loaded and is very spacious, but the body style may not appeal to everyone and finding a qualified servicing center may pose a challenge for some buyers. Overall the SRX’s build quality is good and the cabin is comfortable. If you are interested in the Cadillac SRX, get yourself a used car quote online. This entry was posted on Thursday, August 7th, 2014 at 12:19 pm by admin and is filed under Uncategorized. You can follow any responses to this entry through the RSS 2.0 feed. Both comments and pings are currently closed.